This book has hardback covers. Ex-library, With usual stamps and markings, In fair condition, suitable as a study copy. No dust jacket., 550grams, ISBN: 0001953117. Dr. Seuss. Very Good. How terrible to be poor Herbie Hart, who has taken his Throm-dim-bu-lator apart! Or the Crumple-horn, Web-footed, Green-bearded Schlotts, whose tail is entailed with un-solvable knots. 64 p. Dr.Seuss Classic Collection . Illustrations. Intended for a juvenile audience. 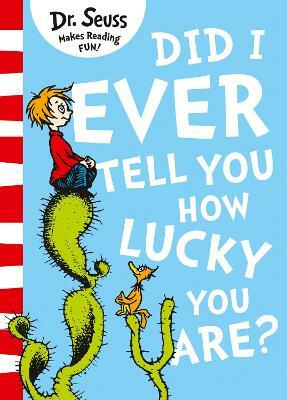 All Editions of Did I Ever Tell You How Lucky You Are? This book is exactly the medicine all of us need when feeling down and depressed about life. A reading of this book is uplifting and results in anyone facing a down moment to re-think and discover what a great value their life.is. Another Dr. Seuss remedy book!